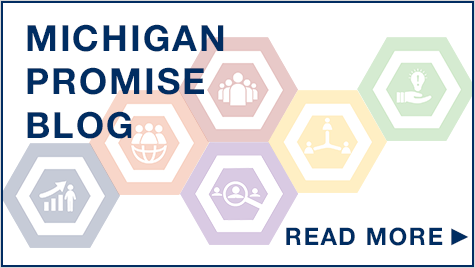 The University of Michigan Department of Surgery through the Michigan Promise has made a commitment to foster surgical innovation. Surgeons are continually engaged in the incorporation of new technologies in their practice. In the operating room, the clinic, and the laboratory, they combine technical skill with creative problem solving to improve tools and techniques for patient care, making them natural innovators. However, despite these innovative tendencies, formal education for surgeons on the process and roadmap for how to turn innovative ideas into real-world solutions that will advance the care of surgical patients is lacking at most institutions. This educational challenge is compounded by their limited time and availability to engage in this learning process, especially when increasing clinical productivity and revenue metric pressures are being felt across the country. Given these challenges and the need to develop better surgical technologies, the University of Michigan Department of Surgery through the Michigan Promise has made a commitment to foster surgical innovation as a part of its culture and provide faculty and staff with resources to explore and develop new surgical technologies that will improve the lives of surgical patients here in Ann Arbor and around the world. In addition to generating great surgical innovation projects, the course provided key knowledge and resources to the participating surgical faculty, allow them the time and ability to pursue their innovation interests. Through this course and process, many have gone on to be serial innovators and have engaged other innovation resources around the campus (such as Fast Forward Medical Innovation and Coulter Funding Programs). This has created a wonderful cultural evolution in the Department where surgical innovation and entrepreneurship have become part of the academic DNA and it is seen as something worth supporting and recognizing within the Department. This departmental commitment to fostering and enhancing its innovation culture, lead to the vision and creation of the Michigan Surgical Innovation Prize Fund. 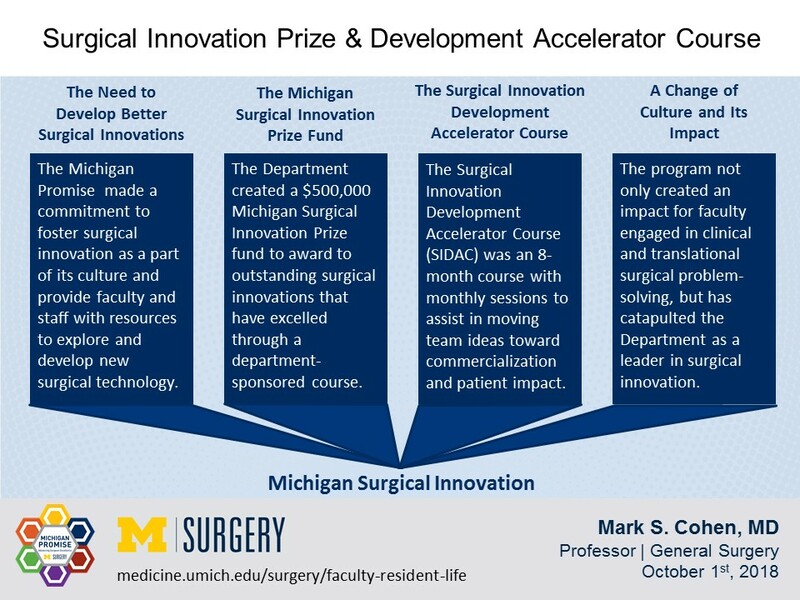 Through this fund, within the Michigan Promise, the Department created a $500,000 Michigan Surgical Innovation Prize fund to award to outstanding surgical innovations that have excelled through a department-sponsored Surgical Innovation Development Accelerator Course (SIDAC). The Michigan Surgical Innovation Prize is the first of its kind in the country and its mission is to foster and accelerate the development of novel technologies that will improve surgical diseases or the care of surgical patients. The first round of the $500,000 prize was awarded in August 2018 to 6 outstanding surgical innovations lead by faculty in the department. In August of 2017, a request for proposals for the Michigan Surgical Innovation was sent out across the Medical School and the School of Engineering. Each proposal had to address a surgical problem or disease with an innovation or solution that improves the lives of surgical patients. These innovations could be in the form of new devices, diagnostics, therapeutics, digital health solutions, or programmatic efforts, but all had to be translatable into real patient/commercial impact. Multidisciplinary collaborative team projects were encouraged as long as a surgery faculty member was actively involved. We received 38 outstanding proposals into the competition in the form of an executive summary. Each was reviewed, discussed, and ranked by our innovation prize oversight committee, made up of faculty experts in and out of the department as well as engineering, industry leaders, and venture capital partners to assure content expertise, oversight and expert diligence regarding funding decisions and the proper use of funds. From this cohort of 38 applications, 12 finalist teams were picked to participate in the newly updated Surgical Innovation Development Accelerator Course (SIDAC), which was run by David Olson PhD, an entrepreneur in residence at the Office of Technology Transfer. This was an eight-month course (January - August 2018) with monthly sessions set up to assist teams in moving their ideas toward commercialization and patient impact. Each team had expert instruction, guided expert mentorship and coaching, as well as peer mentorship and coaching from others in the course, and resources for patent filing, prototyping, and customer discovery provided through the fund and supported by the Office of Technology Transfer and the Fast Forward Medical Innovation group. SIDAC taught teams the following concepts: idea generation, value proposition, intellectual property and patent submission, regulatory pathways, customer discovery, marketing and adoption, reimbursement and funding models, prototyping and pitching. The teams all worked on advancing their technologies through the course and on August 24, 2018 they provided their updated executive summaries of their technologies and pitched their ideas to the oversight committee for questions and evaluation. Of the finalist teams presenting to the OC, 6 of the teams had technologies advanced and derisked enough to warrant $480,000 of funding through the Michigan Surgical innovation Prize. The top 4 teams then pitched their innovations in front of the entire department and 3 guest Sharks at a Shark Tank-style Grand Rounds on September 6, 2018. Sharks for the event included: Dr. Kevin Tremper, MD, PhD, The Robert B. Sweet Professor and Chair of the Department of Anesthesiology; Paul McCreadie, Managing Director, Arboretum Ventures; and Jonathan Murray, Director, Draper Triangle Ventures. Ferroximend combines an angiogenic stimulant, deferoxamine, with an osteogenic (bone forming) tissue filler device, hyaluronic acid. This unique combination triggers the formation of blood vessels at the fracture site, at the right time, leading to a remarkable ability to heal difficult fractures and accelerate that healing process. MEND is a device technology therapy that uses the well-established medical principle of mechanotrasduction to induce growth of new intestine and is intended to safely treat short bowel syndrome unlike current available therapy. The minute coaching system is a proprietary software product that lets medical students get real time feedback from faculty. The goal is to sell/license this product out to other medical schools, either directly from University of Michigan or via an existing company with a franchise in the medical education market.  Surgical Asset Tracker is a University of Michigan startup that develops and commercializes software solutions for tracking temporary implantable devices, providing automated, high fidelity device-tracking with alerts and works with any major EHR. A multi-camera based integrated imaging system for improved visualization during laparoscopic surgery. Teams funded through the program will now use the money toward advancing their technologies to meaningful impact for surgical patients in a timeline and milestone-based format. Funded teams will continue to meet with their mentors/coaches and provide updates to the oversight committee twice a year with a formal update presentation session next year in August 2019. Teams are also eligible and encouraged to apply for other funding mechanisms within the University (Through FFMI or the Coulter Program as well as through the Center for Entrepreneurship) as well as outside the University (National SBIR/STTR funding from NIH or NSF). The next request for proposals for our 2nd Round of the $500,000 Surgical Innovation Prize will be opened in August of 2019 with the goal of increasing the prize value and program resources through individual and industry collaboration and support. The last 3 years have demonstrated numerous successful programs and resources for faculty in Innovation and Entrepreneurship across the medical campus and the SIDAC program in the Department of Surgery is one of the more advanced and tailored programs of this group and unique among Departments of Surgery in the world. Our success in this area has stimulated change in other departments on the medical campus, leading other departments and centers to engage in their own innovation efforts. Together this has created a broader impact on our culture here at the University of Michigan, where “Innovation” has now become one of our core values. Through this transformative first Michigan Surgical Innovation Prize Competition and SIDAC course, over 40 surgeons, scientists, engineers, surgical residents, and medical students gained critical knowledge of the value and development of surgical technologies toward patient use and impact. These participants now understand how to navigate their ideas through the university as well as beyond into the market. The program has not only created tremendous impact within the Department for faculty engaged in clinical and translational surgical problem-solving, but has catapulted Michigan’s Department of Surgery as a national leader in Surgical Innovation and our SIDAC educational curriculum and program will be highlighted in an upcoming Textbook on “Innovation and Entrepreneurship in Academic Surgery” that has been recently commissioned by SPRINGER-NATURE publishing group. I am incredibly fortunate to be a part of a highly creative, motivated, and dedicated group of colleagues here in the Department of Surgery. Our surgeons, residents, and medical students are inspiring innovators and problem solvers. Through our diverse and collaborative culture, when our surgical innovation teams and faculty are given the right educational tools and resources, they produce transformative surgical innovations and technologies that will not only advance the field, but also provide meaningful impact to the patients we care for everyday. It has been a true privilege to be a part of this highly successful surgical innovation effort in the Department of Surgery and I am definitely looking forward to the great things we will accomplish together in the years to come.